A cuff of creative openwork fabric? Or just a bunch of scraps wrapped around my wrist? I'm still deciding. I first learned this technique of creating fabric in day camp many, many years ago. I was 5 or 6 years old at the time, and I think I'm recalling the method correctly. We called it making "doll scarves". The first step was to select yarn scraps and pre-made narrow strips of cloth. Where did those cloth strips and pieces of yarn come from? Well, color-coded boxes, of course! Since my mother didn't sew at the time and never knitted or crocheted, I didn't know where our materials came from. I recall asking for a box of scraps for my birthday that summer, and I imagined a shop that sold packages of colorful scraps. Thinking back about it now, the yarn and cloth scraps probably were left over from other campers' sewing and other craft projects. I think the older girls, the 10- and 11-year-olds, even got to work with the sewing machines in the sewing room. Guided by our camp counselors, our next step was to dunk popsicle sticks in glue, dot the glue on the scraps, and creatively arrange the colorful pieces of fiber onto thin (tissue?) paper. We then left our work to dry. We busied ourselves with other arts and crafts projects over the next couple of days. But one day when we returned to our crafts room, we found in our cubbyholes our scrap and paper constructions dry and miraculously stitched to the paper. I now suspect that the 10- and 11-year-olds, or perhaps the counselors, had completed the stitching phase of our project. Thus, we began the next part of our scarf making. This task was to rip as much tissue paper from our creations as possible. If we hadn't listened to our camp counselors' original instructions and used too much glue during day one, the ripping process soon became quite tedious. Whether we'd used glue sparingly as instructed or overdid things with glue globs, little pieces of paper would always remain. And we weren't done yet. Next we soaked our future scarves for dolls in a bucket of soapy water. At some point during the afternoon we'd return to lay our fabric outside on the grass, where the counselors would hose our scarves down with water. We then hung the scarves up to dry on a clothesline. They were already pretty little pieces of lacy fabric and they looked amazing hanging in the sun. The next day our tiny scarves were dry. It didn't matter that I didn't have a proper size doll to wear the scarf fashionably. (My dolls were either too small or too big. I did have a smallish doll, who could wear it as a gigantic wrap, however.) The important part is that I was enthralled with the fabric, the first fabric I ever made. Even the comparatively neat potholders we'd eventually weave at camp were never this special. Last week Samina of Sew Everything Blog posted a beautiful tribute to her late friend Suzy Seed. Though much more technically sophisticated, the lovely scarves that Samina shows in her post reminded me in some way of the doll scarves I once made at day camp. Inspired, I decided to recreate the doll scarf process and make an adult-sized scarf for myself. I decided to use Sulky water-soluble stabilizer (like Samina) instead of tissue paper and chose fabric from my collection of sweater knit scraps. Then I got cautious and settled on making a small test piece (not a doll scarf) instead of an adult scarf. I'm glad I started small; my method remains in "test mode". But I see real possibilities. 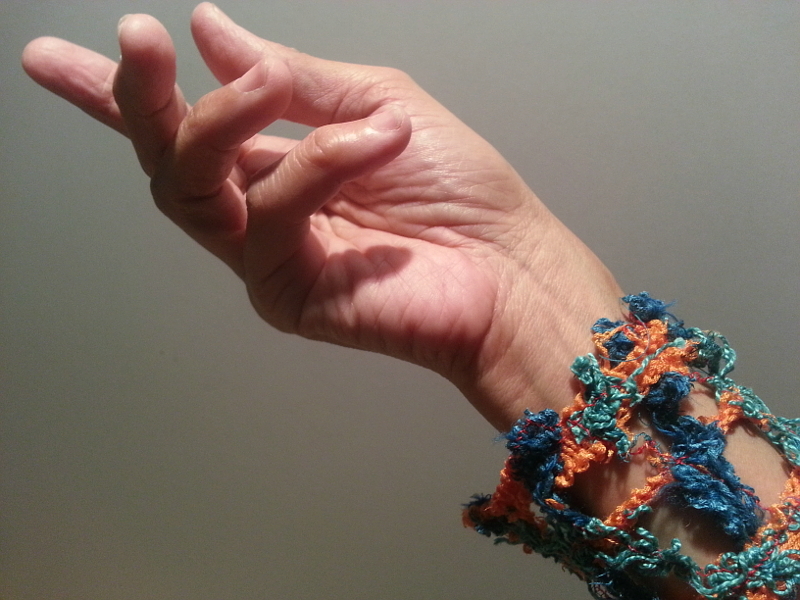 The orange scraps from the Tangerine Top are bamboo rayon. The Turtle Beach sweater's deep teal blue scraps are wool and bamboo rayon. 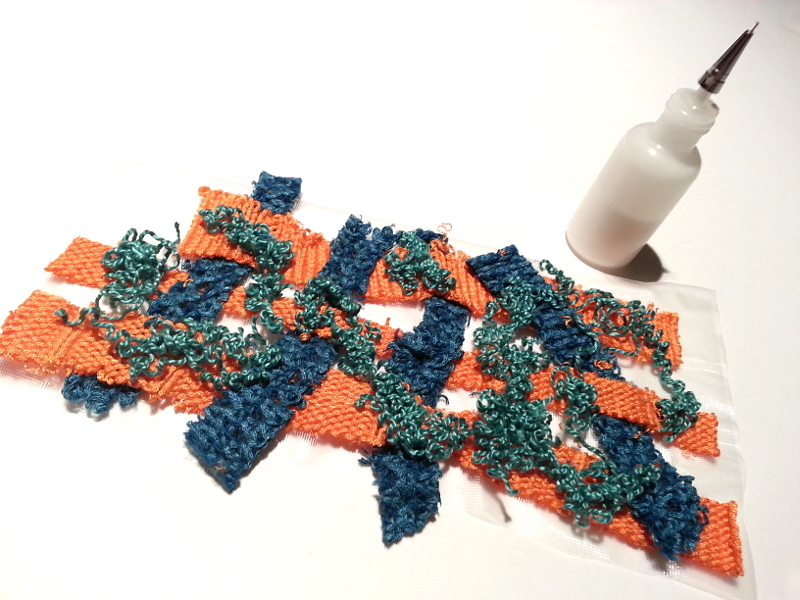 The turquoise squiggles are deknitted bamboo rayon from an old failed swatch. 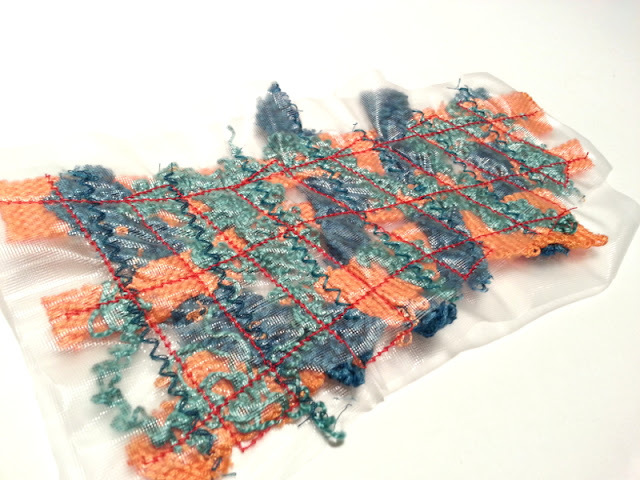 All fabric pieces and yarn were glued onto a sheet of Super Sulky water-soluble stabilizer. (I always have Super Sulky on hand in case I need it to use like this or like this.) As my construction dried, I realized that my machine might not be able to actually sew over the mess complicated texture. I ended up sandwiching the scraps between two layers of stabilizer. I sewed a triple zigzag lines in teal and a grid of lightning stitch in red. I then rinsed well, allowing the stabilizer to dissolve away from the construction. After squeezing out the excess water, I allowed my test piece to dry. The top most picture of this blog post was my final result pinned around my wrist. Anyone else ever make doll scarves at camp? Join the Crafting Fashion email list for tips, techniques, news, and discounts on O! Jolly! fabrics. Great post---love the memory from camp. This is why kids should get to try as many things as possible. It is so sweet that you asked for a box of scraps for your birthday. The innocence is charming. That's a very cool tryout for your camp scarf! Thank you for the link to my scarf post; if I remember Suzy's class correctly, a grid was marked on the soluble stabilizer before we began sewing. How it ended up as infinity, I will have to figure it out. By now, my senior brain forgot where it put that information. Thanks, Samina. I do have fond memories of the camp scarf, but some parts of the memory are a bit fuzzy!